#G182* – SOME THOUGHTS ON THE VALIDITY OF NATIONAL CONSTITUTIONS! 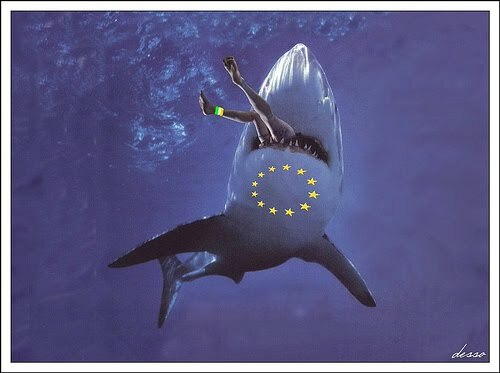 Just howmuch can the EU shark swallow and just what will happen when it dies? I thought the summary on the relevance of The Irish Constitution etc. might prove of wider interest than on merely The Irish Politics Forum on which I post. This has been a lengthy conversation over a day or two which can be followed if you CLICK HERE under the subject ‘A self-amending treaty’. You may wish to join in as a contributor on the Forum which has a wealth of information and is very active with almost 20,000 members, many of whom are well known and many well informed whilst there are the normal salaries infiltrators defending positions at the troughs on the Gravy Train! I am a little confused by your posts – are you saying that the EU can impliment legislation that overides our constitution where the said legislation impeades our constsiution . The very fact that Ireland are having a referendum on the Lisbon treaty defeats your theory that our constitution is not protected and the EU can implement legislation overiding our constitution. my apologies as I have not the time to give chapter and verse – nor do I place much validity on any paper work as drawn up by The ENARCs and bureaucrats of Brusells. Firstly much of the New Lisbon Constitution has already been implemented since the rejection by France and The Dutch. Even more has just rolled ahead regardless of signature since The Irish rejection. It has been clearly promised that the concept does not implement a State in its own right – yet it now has its own flag, its own anthem, its own EU wide armed police force (EUroPol – HQ the old Gestapo HQ in The Hague! ), its own centrally controlled Rapid Repression Force, central control of agriculture fisheries and of course law, with its own courts backed by pan EU arrest warrants. Which bits have I missed and what had you missed? Oh yes an EU wide surveillance system with Galileo which is now of no military value since some school kids in America broke all its codes with equipment bought in Tandy! Such that the Chinese have effectively pulled out and it seems had their money compensated by GIVING them a fleet of the near unsaleable AirBuses. Of course I say unsaleable as it has only been EU flag carriers that seem to have purchased to keep the entire subsidised and grossly over budget scam staggering forward and of course Thai Air but I gather they were forced to buy as they were told that the standards of import of shell fish and chickens to the EU would be raised to a level they could not supply unless they bought an AirBus or two. Perhaps it had escaped your notice any Irish Referendum which does not supply the result the unelected allien central bureaucracy requires must be held again. What use is the protection of a National Constitution by referendum when the result of the referendum is utterly invalid unless it delivers the result required by your masters! Perhaps you have not watched the video on YouTube of Pottiger boasting on the floor of the EU’s pretend parliament of how over 80% of all laws in the whole EU are made by the EU. Wriggle, squirm and dissemble all they like to hide the facts – Ireland no longer has ANY legal status other than as GRANTED by the undemocratic EU. Irish currency is controlled by the ECB and it can not be controlled either by taxation or interest rates without permission. Ireland has absolutely no control over its own fisheries and even less over its farming or borders. Limerick House is nothing more than The Museum of Irish Democracy – the Museum committee can change laws on litter and admission charges but even licensing laws can be referred to The EU’s Courts to overturn local Irish decisions, just as can be minimum wages and how long will the EU tollerate abortion tourism? You will note that Britain has been trying to prevent 22 week + abortions being carried out on British citizens in Spain etc. etc. Sadly, as one may wish it otherwise, I have as yet not seen or been informed of, by someone trustworthy of repute, a single benefit of the existence of the EU which is not massively outweighed by the obscene and dishonest costs both in terms of loss of assetts such as fisheries and freedom and direct financial cost. You may have heard that during the present plennary in the EU it is intended to open the borders of the EU to permit the entry of peoples of the 3rd. world, the logic seems to be that if we let them in legally then there will be less ilegal entry!! Pure Alice in Wonderland logic!!! Where will Ireland house its quota and what pressure will that put on housing? Interestingly in Britain I gather it will necessitate the building of ever more houses in the potential flood planes! Can you for one moment explain how with Lisbon ratified the undemocratic central bureaucracy will be able to implement ANY procedure when 27 vassal states try to bandy their own Constitutions as a right to ignore the EU – Dream on! I believe the document is a farce and the vote is an irrelevancy where a NO vote will require another vote in the spring when yet more of Lisbon has already been implemented keep voting NO and you will note that decisions can be made by the Council of the EU – Have you not read ‘1984’, ‘Animal Farm’ or ‘Brave New World’ – did you not see the movie ‘Logan’s Run’?